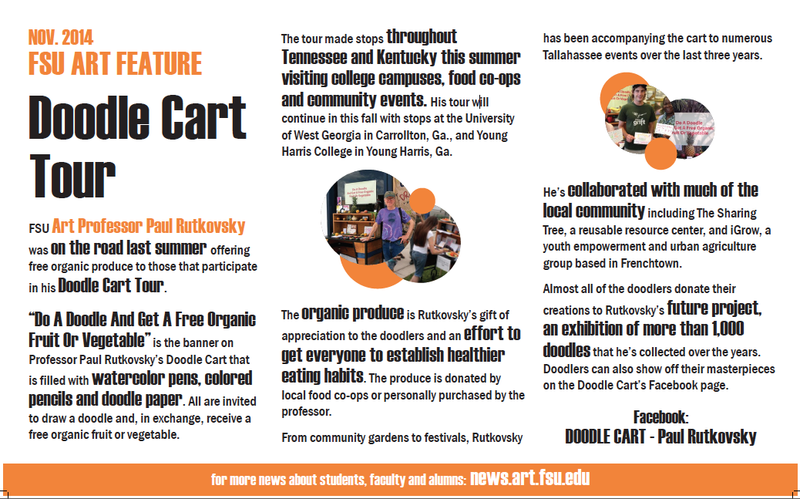 FSU Art Professor Paul Rutkovsky was on the road last summer offering free organic produce to those that participate in his Doodle Cart Tour. “Do A Doodle And Get A Free Organic Fruit Or Vegetable” is the banner on Professor Paul Rutovsky’s Doodle Cart that is filled with watercolor pens, colored pencils, and doodle paper. All are invited to draw a doodle and, in exchange, receive a free organic fruit or vegetable. The tour made stops throughout Tennessee and Kentucky this summer visiting college campuses, food co-ops, and community events. His tour will continue in this fall with stops at the University of West Georgia in Carrolton, GA., and Young Harris College in Young Harris, Ga. The organic produce is Rutkovsky’s gift of appreciation to the doodlers and an effort to get everyone to establish healthier eating habits. The produce is donated by local food co-ops or personally purchased by the professor. From community gardens to festivals, Rutkovsky has been accompanying the cart to numerous Tallahassee events over the last three years. He’s collaborated with much of the local community including The Sharing Tree, a reusable resource center, and iGrow, a youth empowerment and urban agriculture group based in Frenchtown.